Last year Juliana launched the Strega. It’s their 170mm travel full suspension, 27.5” wheeled, go anywhere, do anything bike. For the last several weeks I’ve been riding the peaky end of the range, the Carbon CC frame, X01 build with Santa Cruz Reserve carbon wheels. The test bike is the lighter weight carbon model in the range, weighing about 300g less than the other bike in the range, the Carbon C. It’s a matte green with black and gold detailed logos stenciled out of the paintwork—with the added bonus of not looking that dirty when it actually is. There are bottle cage mounts in the main triangle that fit a full-size bottle into the size small frame. The internal cable housing is clean and, although designed around right-hand rear brakes, works and looks fine with left-hand routing. Attention to problematic shuttle rash and ricocheting rocks on the down-tube are taken care of with bolt-in plastic guards. A nice feature that kept a lot of mud from being flung into the shock was a little guard covering it. The Rock Shox Super Deluxe RCT shock is mounted low and finds resemblance in the Santa Cruz V10 VPP suspension platform, and there is good reason for that, which I’ll get to soon. A RockShox Lyrik RCT3 takes care of the front suspension. Components suit the intension of the bike with SRAM Code RSCs, and X01 Eagle drivetrain. Juliana impressively provide a lifetime warranty on the frame and Reserve carbon wheels and offers lifetime replacement on pivot bearings for the original purchaser. I am 164cm tall and chose the size small frame, putting me in the upper end of the height spectrum for that frame. It has a 420mm reach, which was a couple of centimetres longer than my own bike. The frame fit felt natural and comfortable. One thing to note: it came with a Reverb 125mm dropper post, and while each frame size gets an appropriately sized dropper, Juliana’s local dealer, who assembled the bike for me, said the Reverb’s hydraulic hose would start getting kinked if it were dropped any further than where I had it set for my preferred seat height. A shorter rider might have issues with the 125mm Reverb/small frame combo, but it’s easy enough to swap to a different dropper post brand that fits better with it or opt for the 100mm Reverb. The flip chip allows changes to the frame’s geometry from a ‘high’ 65 degree head angle with a 344mm BB, to a ‘low’ 64.6 degree with a 339mm BB. This also slightly alters the standover and reach. I opted for the 65 degree setting for most of the riding as it didn’t give me as many pedal strikes on my big flat pedals as the low setting and still provided heaps of stability and carvability when cornering. 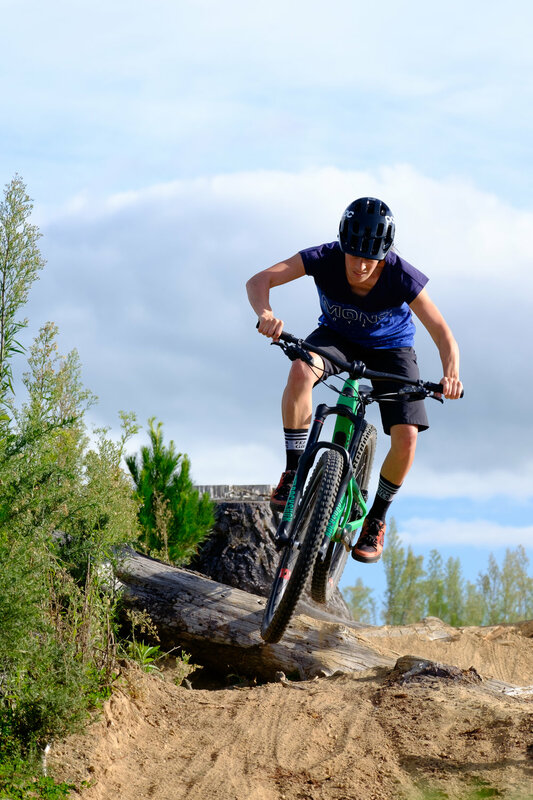 One of the things Juliana has done that does make a difference to women is the Strega comes with a lighter rear shock tune that allows a proper compression and rebound damping for a lighter rider. This feature is often over looked by companies on their big mountain bikes but makes a massive difference to us lighter riders. I also found the ‘narrow’ 760mm Santa Cruz carbon handlebars and Juliana Primeiro seat nice and easy to get along with. The Maxxis Minion DHF/R 2.5/2.4 tires popped onto the Reserve 30 carbon wheels did the trick with heaps of traction. To be honest, I don’t follow the latest developments in suspension and frame design that closely and neither do most of the women I ride with. As one says: “just ride your freakin’ bike”. I do know how I like a bike to ride though. 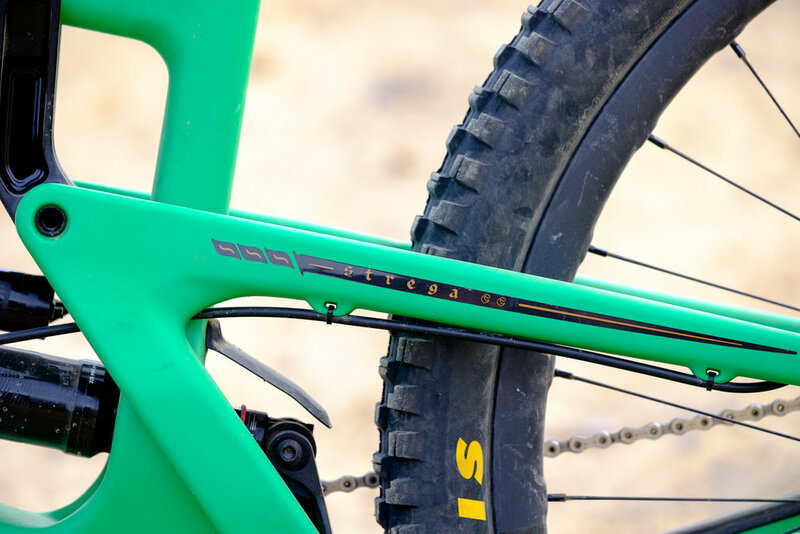 The Editor on the other hand is a huge bike-nerd and explained at length to me about how the new Strega (and Nomad) use the linkage arrangement of the iconic Santa Cruz V10, rather than the linkage system of the rest of Juliana and Santa Cruz’s bikes. The difference is that in the Strega, Nomad and V10, the lower link drives the shock because amongst other things this creates an evenly progressive suspension rate. It’s obviously a more difficult thing to package because there’s a lot to fit in down in that area – the cranks and rear wheel and now the shock too, while the upper link now hangs noticeably devoid of a shock. But it’s worth it because this arrangement is what created the exceptionally supple-off-the-top feel, the support in the middle and the just-right bottom-out resisting end stroke that I liked so much. I know climbing can be an issue with long travel bikes and my own 140mm bike is heralded as an excellent climber, so I was surprised to find there was really very little difference tackling climbs aboard the Strega. Partly thanks to its 74.5 degree seat tube, partly thanks to that supportive middle part of the suspension, and despite its downhill orientated setup with a 65 degree head angle, climbing on the Strega felt fast and efficient, and the shocked expression on the sweaty lycra-dudes I passed up the fire road backed that feeling up. The Super Deluxe Shock has a platform damping lever you could flick up if you like the feeling of riding a hardtail uphill, but this option was unnecessary; the Strega didn’t bob about on climbs, even when I did my best impressions of a masher, with the suspension free to enhance traction where needed, such as on the slippery little pinches on Tuhoto Ariki in Whakarewarewa Forest. Despite the suspension layout owing a lot to the V10 downhill bike, I reckon this is exactly how suspension is meant to work uphill too. But that’s really an aside, because this bike is happiest — and most of the people I know are happiest — when the trail goes down. The rougher the trail, the faster the Strega wanted to go, picking up speed effortlessly on rocky or rooty trails. Compared to the 140/150mm bike I’m used to riding, trails like Tuhoto with faster sections of rooty terrain got heaps easier because I was able to let off the brakes and let the bike soak it up while the bike picked up speed, rather than feeling like the bike was getting slowed down by smashing into all the roots (and my brakes). Steeper trails like Hatupatu with a few drops thrown in were tackled with more ego than I’m used to having. In terms of the lower mounted VPP the suspension felt even throughout the travel, with no wallow. At 30% sag the setup felt right and I got most of the way through the travel over bigger stuff. I even got up the courage to hit — and land — a few gap jumps that had been playing on my mind. Having not ridden a bike this big (in suspension terms) for more than a borrowed quick hoon I wasn’t too sure what I was getting myself into. I’ve ridden trails that pushed my comfort levels but never really thought it was my bike that was holding me back. But once on the Strega, I felt immediately that, once my head got in the right confident zone, the bike would push me to do the things that I could previously only imagine doing on the trail. And sure, once I had the confidence through doing it on the Strega I might be just fine on a smaller travel trail bike but I’m a bit nervous and not looking forward to giving it back and having to find out if that is true. Sure, it can be ridden on your local flow trail, but its sparkle won’t be there. You’d be repressing its spirit. I have done that a couple of times. There’s nothing stopping you taking it on mellower tracks, but mostly what I found myself doing is changing my regular riding routes to drop easier tracks and replace with harder tracks, and that is a good feeling. 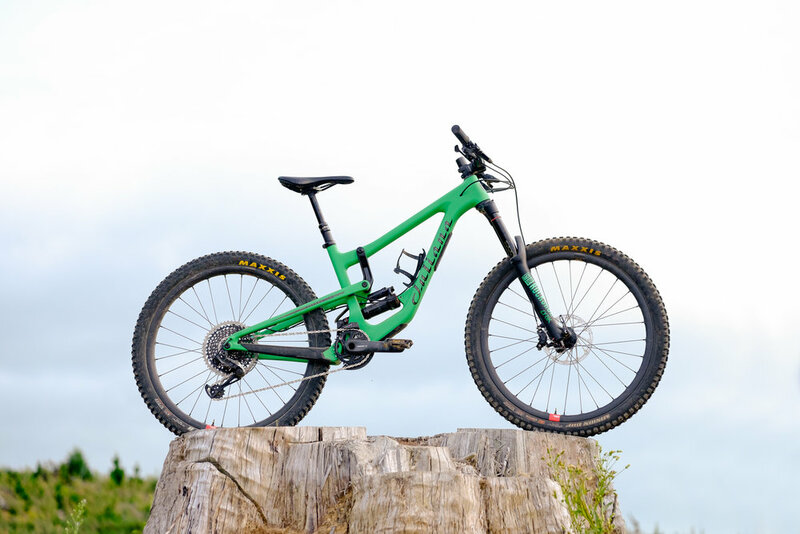 In short, to really make this bike happy, mash, drive or chopper it up to the highest point of the gnarliest trail you never thought you could ride (but the little bit in your belly said you could) and let it fly. At $11,999, plus a couple of grand to upgrade to Santa Cruz’s Reserve carbon wheels, this particular bike is the most expensive bike I’ve ever ridden by a long shot. It’s got the top-end of everything on it though, and the Strega is available at a range of prices, including almost half the price of the one I rode, so it’s not a requirement to go this spendy. Juliana’s bikes are priced at about the same as other boutique brands’ carbon bikes, though you also get a lifetime warranty and bearings for life, which isn’t often the case elsewhere. The Strega is a top of the line badass bike for people that love big mountains (who just happen to be women). 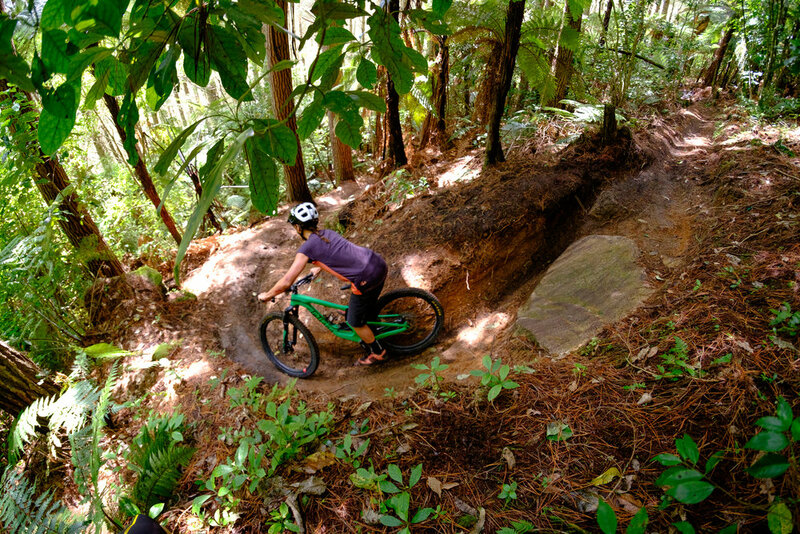 I would feel real stoked having it as my sole bike for the type of riding I do in my home of Rotorua and the odd trip to exotic locations such a Nelson or Queenstown. Oh, and to stop you guessing, Strega is named after the Italian word for witch, not the liqueur.